Welcomed at Bergamo airport. Transfer to your hotel and bike check. After a 10km climb, we cross the border into Switzerland and face up to the Passo del Bermina (2328m) followed by 2 passes: Passo di Livigno 2315m and Passo del Foscagno 2280m. You will definitely enjoy the 20km descent to finish in Italy! We spend 2 nights in Bormio. 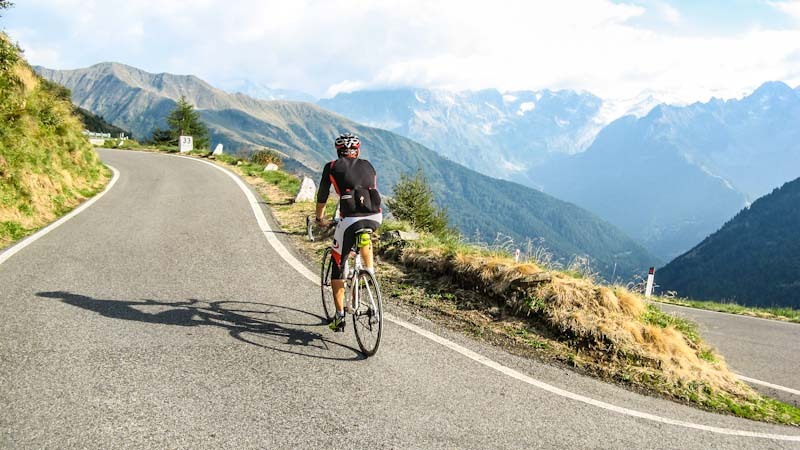 Relax or ride an amazing loop with the difficult Passo del Mortirolo (1852m, 10% average) and the stunning Passo di Gavia (2621m). A monument: Passo Stelvio (2757m), 20km ascent across incredible scenery. Enjoy the extraordinary descent along a road you can see for miles. You will soon reach, at 55km, slight slope to raise our average speed. After an easy start in the valley we cross Bolzano and the road starts climbing ! The ascent to Passo Gardena (2121m) is wonderful ! The route ends on a descent to join the famous ski station Selva di Val Gardena. Spectacular day in typical Dolomites landscapes. After the Passo Sella (2240m) we cross the no less famous Passo Pordoi (2239m). End of stage denouement with the Passo Valparola (2168m). Last but not least ! Climb the beautiful Passo di Giau (2233m) before the last pass of the week: Passo Duran (1601m). The scenery is breath-taking: calm roads, perfect tarmac, high mountain pastures, typical chalets, forest roads, soaring stone summits... End the week by crossing the Schiara Occidentale before arriving in Belluno. The trip ends in Belluno after 7 amazing stages. Please ask us if you need to be transferred to an airport or train station.